With the four-year anniversary for the start of the Iraq War and in the context of fresh legislative efforts by the Democratic Party to challenge George W. Bush’s Iraq policy, the Democrats’ attempts to establish their own alternative discourse on Iraq warrant some closer scrutiny… Full story here. On December 24, 2005, an Iraqi writing under the signature “Hammad” published a remarkable message on a website devoted to southern Iraqi affairs: “In the name of God the merciful and compassionate: To the activists of the world, to the United Nations: Look at the south, look at the richest area in the world in terms of oil, agriculture, culture and science…. [But] look at us, and you will find cities destroyed as if they were Sumerian ruins…. 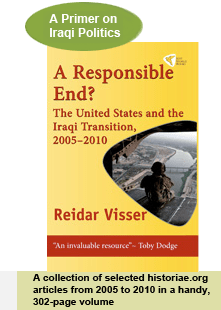 The age of the tyrant Saddam came to an end and everything was going to change…. But nothing changed…. The people of the south are marginalized and have no representation in government…. When we turn to the government they tell us the Iraqi government is a spoils system and the south will obtain its share through the Shi‘i parties! Sir, the majority of the leaders of the Shi‘i parties are from the middle Euphrates area and Baghdad. They give all the positions to people from those areas and don’t give a fig about the south…” Full story here.